When a space rock slammed into the moon earlier this year, it tore a big new hole in the already pockmarked lunar surface and generated an explosion that would have been visible to the naked eye from Earth, scientists say. New images of the moon crater from NASA's Lunar Reconnaissance Orbiter (LRO) show that this hole stretches 59 feet (18 meters) across, with radiating steaks of debris from the impact covering an area half the size of a football field, according to the website Spaceweather.com. The orbiter's LROC camera snapped new photos of the crater in July as the spacecraft flew over the impact site, which is in a large plain in the moon's northern hemisphere known as Mare Imbrium ("Sea of Showers"). By analyzing the images, scientists determined that the rock responsible for the impact was 0.65 feet (0.2 meters) wide, Spaceweather.com reported. The researchers presented their findings last week at the annual meeting of the American Geophysical Union in San Francisco. Earlier this year, scientists said the space rock that gouged the new hole in the moon may have been related to a meteor shower over Earth at the same time. "On the night of March 17, NASA and University of Western Ontario all-sky cameras picked up an unusual number of deep-penetrating meteors right here on Earth," Bill Cooke of NASA's Meteoroid Environment Office said in a statement in May. "These fireballs were traveling along nearly identical orbits between Earth and the asteroid belt." The Earth's atmosphere acts like a shield against impacts from small space rocks, which often slow down, burn up and break apart before they hit the ground. Surrounded by the airless vacuum of space, the moon lacks such protection, making meteoroid strikes quite common. 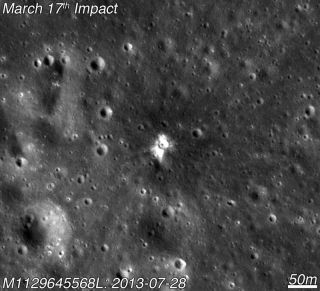 Over the last eight years, NASA's moon impact-monitoring program has spied more than 300 flashes of light, interpreted as space rocks slamming into the lunar surface. LROC's principal investigator Mark Robinson wrote in a post on the project's website: "This is not the first new impact crater the LROC team has found, nor will it be the last!"